All my children have enjoyed Maisy at some time or another. She's a favorite little mouse of ours. When offered a chance to check out Maisy Grows a Garden I couldn't say no. If you know Maisy books, you know that this is not a fact-filled read, but rather pictures Maisy and various garden vegetables and, in this case, a little worm wriggling in the soil. Maisy is most appealing to 2-4 year olds for the simple sentences, and the bright, bold design of the characters and settings. 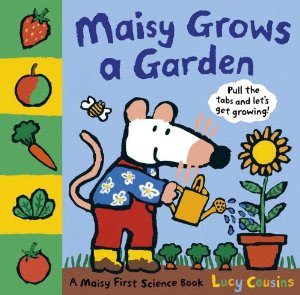 Maisy Grows a Garden is a pull-the-tab book. When you pull the tabs you see Maisy shoveling dirt, watering her garden and see seedlings poking through the dirt. On each page spread you will also find a box of gardening vocabulary words such as "shovel", "tulip", "seedlings", "snail", "carrot" and "tomato." It being a pull-the-tab book made it an instant hit with my children. However, I have to say that I didn't find the tabs very durable for little hands. My two year old had a very hard time manipulating the tabs and managed to tear one in record time. My four and six year old seemed to manage with more sensitivity towards the page design. You'll want to oversee usage of this book as a general rule. Or just don't expect it to have a very long shelf life! Look Up! 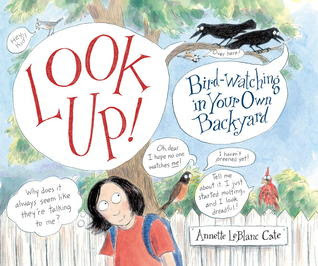 : Bird-Watching in Your Own Backyard by Annette LeBlanc Cate is a real winner! It's a fairly long picture book at 51 pages, and it is packed full of useful information on the art of bird watching. It is basically a whimsically illustrated "How To" for birdwatching. The beauty of it is that Cate opens the door to the idea that you can enjoy nature from your own home! "Some people think that nature is something experienced by other people - people who live out in the country. But no matter where you live, you are a part of the natural world, just as the birds and other creatures are. Your thoughts, feelings, and observations about nature are just as valid as anyone else's. Your the only one who can keep track of your specific experiences, so keep your sketchbook with you, write things down, and draw pictures. It's important." Each page offers tips and advice on how to begin birdwatching, the importance of keeping quiet and just watching, tips on how to identify birds by colors, beak shapes, wings, etc. Meanwhile each page is filled with illustrated scenes of people and birds with thought and word bubbles sharing songs, rhymes and encouragement to see birds in new ways. I highly recommend this book as a great resource in helping younger children connect with nature and BIRDS! 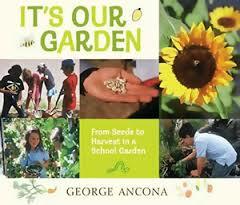 The kids and I all really enjoyed reading It's Our Garden : From Seeds to Harvest in a School Garden. An elementary school in Santa Fe, New Mexico decided to grow a school garden and George Ancona spent a year photographing their efforts. This book tells the story of the teachers, volunteers and students who set out to design and build a garden that could be enjoyed by the entire community. Now, we home school, in part, for the reason this book was written: to encourage the idea of a hands-on education with practical real-life experience. Learning should be exciting and fun and should involve plenty of opportunity to explore the actual world around you by getting outside into the world rather than staring at it through photographs. I love that this school designed a garden and then taught the children about how to grow different vegetables, how to compost, how to conserve and build and enjoy something that they themselves worked hard to produce. It's a really lovely and exciting idea. Ancona's photographs of the actual individuals who brought this garden to life and made it a place to live in just thrills the soul, that's what! I love that my kids can go out and play in our yard and grow things for themselves for our family to enjoy. And I also love that the students at this public school in New Mexico are learning a practical skill and are exploring their own world with outdoor classes and projects which allows them to get their hands dirty. We need more of this! Love this book! My kids were interested in it also, in part because they can identify. They were allowed one portion of our land to grow flowers in the yard (they chose mammoth sunflowers) and also two large pots to plant something of their choosing. (They chose strawberries and snake gourds. So we're growing snakes! ;) I love involving them in gardening and I am happy to let them choose what they want to grow. It's FUN and it's beneficial to the whole family. Our gardening experiments continue and we are enjoying learning more about how to enjoy this beautiful world that God created for us to live in! Many thanks to Candlewick Press for sending copies of the above three titles in exchange for our honest thoughts. That garden book does look neat. We participate in a community garden, and N&N enjoy helping out. Look up sounds great! I've always been intrigued by birdwatchers, but have never done it myself, not being one to sit still without a book in my hand. However, one of our branch libraries has a copy, so I might have to take up birdwatching kid-style.